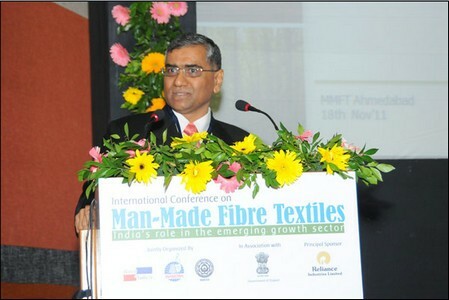 ‘International Conference on Manmade Fibre Textiles’ was held in Ahmedabad at the prestigious campus of the Indian Institute of Management (IIM) in Ahmedabad. The hall was packed with delegates, who included global and Indian experts, industry leaders and stakeholders from the textile industry. The conference was organised by Fibre2fashion, the leading global B2B website for the textile, apparel and fashion industry in association with the Southern Gujarat Chamber of Commerce and Industry (SGCCI) & Surat Art Silk Cloth Manufacturers Association (SASCMA). More than 25 eminent speakers from the global and Indian manmade fibre textiles sector had lined up at the conference and kept the 300 plus delegates enthused with their informative presentations and panel discussions. Topics lined up at the conference ranged on shortcomings of adequate cotton fibre supply in the future to why manmade fibre textiles will dominate consumption in coming years along with presentations on latest global textile technologies. 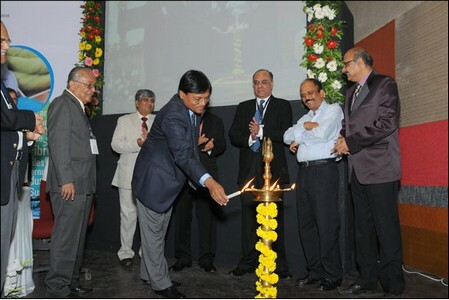 Inaugural in presence of Mr Maheshwar Sahu - IAS & Principal Secretary (Industries & Mines) - Govt. of Gujarat, Mr Sanjiv Shah – CEO, Fibre2fashion, Robin Anson - Managing Director, Textiles Intelligence, UK, Dr PR Roy - Conference convener, Mr Rohit Mehta – President SGCCI, Mr Arun Jariwala – Chairman, SASCMA, Mr RD Udeshi - Reliance Inds, Mr SN Modani – Sangam Group and Mr KK Maheshwari-Grasim Ind. At the inaugural session, on the dais were present, Mr Maheshwar Sahu – IAS and Principal Secretary (Industries & Mines) – Govt. of Gujarat, Mr Sanjiv Shah – CEO, Fibre2fashion, Robin Anson – Managing Director, Textiles Intelligence, UK, Dr PR Roy – convener of the conference, Mr Rohit Mehta – President SGCCI, Mr Arun Jariwala – Chairman, SASCMA, Mr RD Udeshi – Reliance Industries, Mr SN Modani – Sangam Group and Mr KK Maheshwari – Grasim Industries. “Global per capita consumption of textile fibres is 11.5 kg, while in India it is 4-5 kg. Manmade fibres will also be in very good demand from the burgeoning technical textiles sector. Two fibres in particular will dominate the global textile sector – polyester and viscose staple fibre. 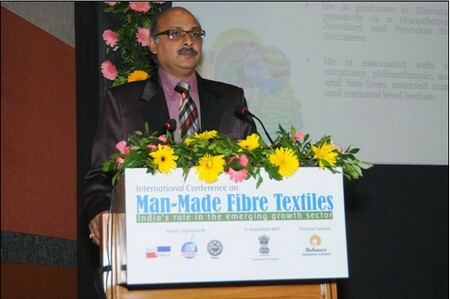 This conference will deliberate on what role manmade fibres will play in the future”, he winded up by saying. 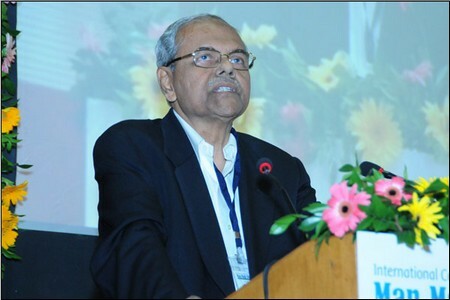 This was followed by an address from Mr Arun Jariwala – Chairman, SASCMA, who said, “A manmade fibre textiles conference is being held after a period of 25 years in Gujarat, with the last one being held in Surat in 1985. Next to speak was Mr Rohit Mehta – President, SGCCI. He said, “Surat is one of the main centres in India for manmade fibre textiles. At a time when the industry is looking for answers to a host of questions, this conference will help in addressing the same. The renowned speakers will definitely throw light on these and many more”. 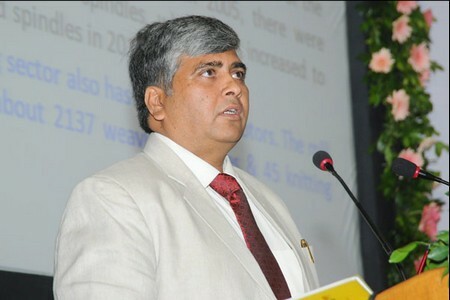 Mr Maheswar Sahu – IAS and Principal Secretary (Industries & Mines) – Govt. of Gujarat, began the inaugural address by saying “With the impetus given by Gujarat government, I hope 2-3 million spindles will be added in the next 3-4 years in Gujarat. However, value added in the Indian textile industry, will come from the technical textiles sector. “In the next 5-6 years, there will be more than 5-6 million automobiles per year, rolling out of the state. This will create a big opportunity for the technical textiles sector in Gujarat”. The last speaker at the inaugural session was global expert, Mr Robin Anson – Managing Director, Textiles Intelligence, UK who presented a paper on ‘Manmade fibre textiles to 2030 – India and China”. He said, “Since cotton competes with food crops for the same arable land, there are very few indicators of rise in global cotton output in the future. At the same time quantum of arable land is also going down. Harvested area of cotton also keeps going up and down, without any noticeable increase in last few years. “Considering that cotton value chain consumes a huge amount of water, getting adequate water in the future could also prove to be a strain”. He added, “Polyester is the fibre of the future, but with consumers looking for moisture management and absorbent fabric clothing, cellulose fibre fabrics will be in great demand. 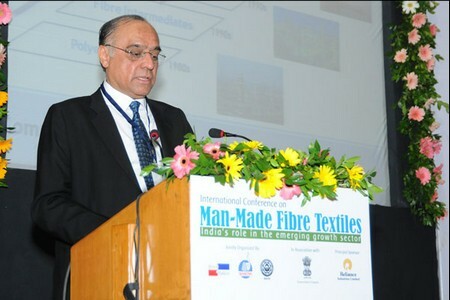 The gap between demand and supply for fibres can be filled up only by manmade textile fibres”, he summarized by saying”. Guests of honour – Mr RD Udeshi – President (Polyester division), Reliance Industries Ltd, Mr KK Maheshwari – Director, Grasim Industries and Mr SN Modani – MD, Sangam (India) Ltd., were among those who gave special address at the inaugural session. Addressing the delegates, Mr Rajen Udeshi, who is associated with Reliance industry since 1984, said, “While share of manmade fibres in overall fibre usage in developed economies has stayed stagnant between 55-60 percent during 1990-2010, that in the developing economies has galloped to 70 percent in 2010 from just 43 percent in 1990”. “While polyester commanded a share of just around 2 percent in overall fibre demand in India in 1980, it skyrocketed to around 30 percent in 2010 and will jump to around 40 percent in 2020. Indian polyester output will grow from around 4.4 million tons in 2010 to around 12 million tons per annum, growing at a CAGR of between 10-12 percent”. K.K. Maheshwari – Director, Grasim Industries Ltd. The next guest of honour to address the delegates was Mr Modani, who has a good insight and knowledge of the various textile markets across the globe. He gave a presentation on the Bhilwara textile industry. Mr. SN Modani - MD, Sangam (India) Ltd.
“Bhilwara is the largest polyester/viscose blended yarn production hub in India, accounting for 26 percent of overall P/V yarn output and has around 14 spinning mills, 5 open-end spinning units, around 2,137 weaving factories and 20 fabric process houses. Ring spindle capacity rose from 225,000 spindles in 2005 to 662,000 in 2010. Out of 16,000 weaving machines at Bhilwara, 14,000 are modern technology shuttle-less weaving machines and by 2020, 14,000 more advanced weaving machines will be installed, which will double fabric production”. He concluded by saying, “The Bhilwara textile industry, which was growing at 3–4 percent during the last five decades, has now accelerated to an annual growth rate of 11-12 percent to make the industry a ‘Sunrise’ sector”. Another interesting presentation at the ‘International Conference on Manmade Fibre Textiles’ came from Mr Ajay Sharma who is GM (New Product Development) – RSWM Ltd, a division of the LNJ Bhilwara Group. The first presentation in the first session came from Mr Andreas Engelhardt, MD, Fiber Year GmbH and author of the world famous “Fiber Year” book. He said, “Manmade fibre usage skyrocketed 1997 onwards and has outstripped that of cotton in recent years and future bottlenecks in cotton supply will further accelerate this expansion”. He concluded by saying, “Calculating at an average annual growth rate of 3.1 percent, global fibre consumption will touch 120 million tons in 2020 and almost 150 million tons in 2030 from 80.8 million tons in 2010. The drivers for growth will be industrial applications, home textiles and floorings with polyester fibre dominating consumption”. Mr Ajay Sardana – Asst VP (Global Customers & Market Intelligence) at Grasim noted, “Viscose Staple Fibre (VSF) though a relatively small part of the global textile fibre mix has shown maximum growth in recent years and has globally grown at a CAGR of around 10% between 2005 and 2010 and shows clear advantages to replace cotton, especially in clothing segment”. Next was a presentation on ‘Opportunities for Man Made Fibre Textiles in Mangalore SEZ’. The SEZ has access to raw materials and feedstock like PET, PTA, PP, Benzene, Propylene at the doorstep as well has close proximity to a uncongested port. The next speaker Mr R D Gupta of Indorama Industries Limited informed the delegates that Indorama was setting up the first Indian spandex filament plant using dry-spun CP technology with equipment from Italy, PR China and Japan, with a capacity of 5,000 tons per year to be set up in three phases, with commercial production scheduled to commence by March 2012. 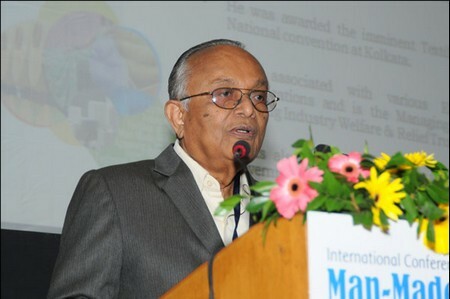 Mr Kishore Shewale from A.T.E Enterprises who spoke on ‘Warp Knitting Technology for Innovative Textile Applications’ informed, “2010 can rightly be called the ‘Year of Warp Knitting’ as demand for warp knitting machines continued to grow from the beginning of 2010, due to huge consumption of warp knitted fabrics in domestic market”. The next presenter – Mr Rajkumar Lakshman of Nantex Machineries Pvt Ltd has turned the embroidery machine upside down, literally. He has designed a vertical computerized embroidery machine, which can embroider lengthwise on a fabric instead of the generations old technology of doing it widthwise. “This technology will ease the task of fashion designers immensely”, Mr Rajkumar said. The day concluded with an icing on the cake for the delegates. For the first time-ever, delegates were able to gain first-hand knowledge of the novel concept of “Forcespinning for Nanofibres” through live video conferencing from the US. Forcespinning – a unique nanofibre technology combines novel equipment and processes to enable more versatile and cost-effective methods for making polymeric nanofibers and metallic nanowires. The other highlight of the conference was the session on the growing technical textiles sector on day-2, which had luminaries showcasing presentations, discussing and deliberating growth & the challenges of the sector. The day began with a presentation from a doyen and one of the first Indian entrepreneurs to foray in to the technical textiles sector – Mr Mohan Kavrie, Promoter of Supreme Nonwovens Group. He explained the different nonwovens technologies like Needle-Punched, Stitch-Bonded, Chemical Bonded, Resin Bonded, Thermal Calendared & Hot-Air Bonded, Spun-lacing/Hydro-entanglement for manufacturing nonwovens. Replying to a question from a delegate, Mr Kavrie said, “It is very easy to produce roll goods and easier to market. However, when it comes to consumer products which use these roll goods, it is very difficult to market these products”. Mr Kavrie added, “Global consumer product players like P&G, PGI and Kimberley Clark are deeply entrenched in the market for years, which makes it difficult for new entrants in the consumer products space to penetrate the consumer mind space”. Mr Kavrie was followed by Mr Gunjan Sharma, who is responsible for the Fibrefill and Non Wovens business at Reliance Industries. He said, “The current global market size for technical textiles is US $127 billion, with volumes growing two times the global GDP. Polyester fibre has a share of 27 percent followed by polypropylene with 22 percent usage in the sector”. Mr. Sharma was of the opinion that non-clothing sectors like automobiles, infrastructure, medical, tourism etc will drive the growth of the sector in India and this will mainly be brought about by the higher purchasing power from the rising incomes of the Indian middle-class. Mr KK Mishra of ATIRA spoke on the subject of composites. He said, “Composites are combinations of two materials in which one of the materials is called the reinforcing phase, which is in the form of fibers, sheets, or particles, and is embedded in the other material called the matrix phase”. “Composites have grown at a CAGR of around 5 percent in China and 5.6 percent in India. The main advantages of using composites is that, it has higher specific strength, can be molded in to complex shapes at low costs, setting up a unit entails low capital cost and final products have a longer life span”, he informed. Applications of composites include aerospace, civil works, marine, wind mills, modular houses and many other applications. Also, during this session, a high power panel discussion was held on “India’s Potential to Grow in Technical Textiles”. Dr Chandan Chatterjee, Director – Centre for Entrepreneurship Development (CED) – Govt of Gujarat, Dr. Talukdar of Kusumgar, Mr Avisnash Mayekar of Suvin Advisors, Dr Basu of MANTRA – Surat, Mr Arun Jariwala and Mr Mohan Kavrie were the panelists. Dr Chatterjee exhorted entrepreneurs to set up technical textiles units and offered full help of the Gujarat Government to set up these units. According to Mr Avinash Mayekar, investors are wary of investing in the technical textiles sector as they are not sure of getting a market for the products that they will produce, so the urgent need is to develop markets. Mr Karvie informed that the future is bright for the technical textiles, but newcomers have to be patient as well as passionate about the business. Mr Jariwala asked the government to frame policies which will help the growth of the technical textiles sector. One example he gave was to make use of medical hospital disposable products like gloves, mask, gown, etc. mandatory like in western countries. Dr Talukdar who represented Kusumgar Textiles, said, “We have done awareness programs on technical textiles for the textile industry and now more number of entrepreneurs should start investing in the sector, as there are lots of opportunities in the sector. “However, there is a dearth of trained technicians in the nonwovens sector. To resolve the same, subject of technical textiles should be included in the curriculum of textile institutes, training programs should be continuously held and the government should come forward and take the initiative to hold these programs”. The panel was also worried over the fact that the Indian government might ban use of a particular type of nonwovens in the future, on the same lines as the ban on plastic bags since, products made from nonwovens are not fully biodegradable. All in all, most of the delegates left on a satisfied note, enlightened and awed by the high level of topics discussed and latest technologies showcased at the conference and admired the order in which, the conference deliberations were conducted. The question-answer sessions were also well appreciated as it enabled delegates to seek first-hand answers to their queries from experts.